What if we told you your skin-care routine was missing one crucial step—and that said step was basically a beauty-boosting mini workout for your face? 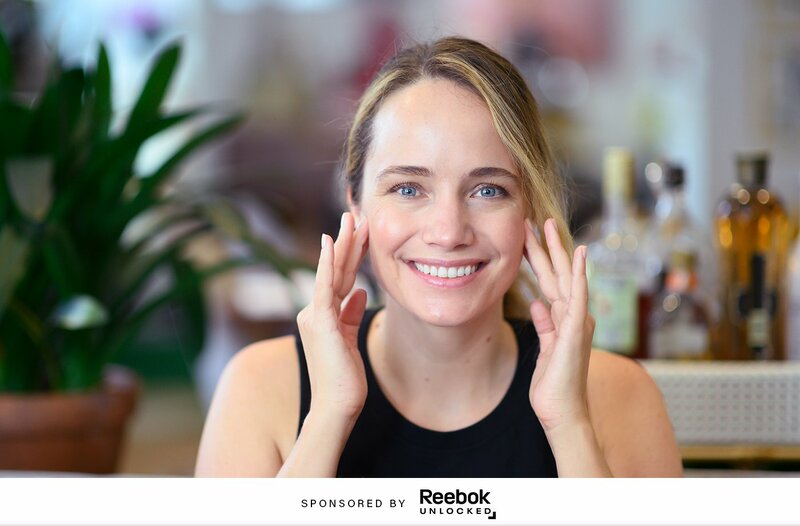 Okay, so maybe a facial massage doesn’t have quite the same muscle-strengthening results of your favorite HIIT class, but it does tap into the same feel-good benefits—which is why beauty and style maven Grace Atwood is obsessed with the technique as a part of her nightly routine. The buzzed-about benefits? Helping your products penetrate better, increasing blood flow, and reducing fluid build-up (AKA puffiness). To clue you in on how to incorporate the practice into your own self-care arsenal, we teamed up with Reebok UNLOCKED (the just-launched wellness rewards program that hooks you up with beauty bonuses curated by Well+Good, among other perks) and asked Atwood to share the benefits and instructions for a pressure-point facial massage. Scroll down for your step-by-step guide to facial massage, straight from an in-the-know beauty blogger. The key to a spa-level massage is making sure your face is oiled up first, which is why it’s ideal to add the practice as the last step to your beauty routine. Her personal evening skin-care routine involves double cleansing (with an oil-based cleanser followed by a gel face wash), then applying a retinol serum, a rich moisturizer, and finally sealing everything in with a facial oil to prep for her DIY massage. Your acupressure points make a subtle heart shape around your face, Atwood explains, and tapping into different ones comes with different benefits. Tracing along that heart-shaped perimeter can help with relaxation, which makes the practice an ideal addition to your nighttime routine. Atwood spends two to three minutes massaging her face in circular motions all along the perimeter of her face, especially focusing on her jaw line and below her cheekbones (because she stores lots of tension there), but feel free to spend more time on the areas that feel good to you. Got brain fog? Atwood recommends spritzing on a facial spray and spending a few minutes massaging your temples and jaw area. She’ll sometimes tap this technique midday when she needs a boost, and will use a spray with energizing ingredients for a natural pick-me-up. Who needs a 3 p.m. latte anyway? We all sometimes hit a level of puffy that no amount of water or eye cream can fix (thanks, salty margaritas and jet lag). That’s when Atwood likes to target areas that stimulate lymphatic drainage. She slathers oil on her neck (she likes Vintner’s Daughter or Everyday Oil) and works her fingers in a downward motion to encourage the build-up that’s making you feel swollen to keep on moving. Oh hey, allergy season. If you’re feeling stuffy (whether it’s from allergies or a legit cold), you can help alleviate some sinus pressure by massaging the pressure point near the middle of each of your eyebrows. Often, when Atwood spends 30 seconds massaging this spot, it works so well it makes her sneeze. But no matter what, it’s worth the time she invests in doing it. “They say, ‘If you don’t have five minutes for yourself, you’re doing something wrong,’” Atwood says. “For me it’s more about how it feels than how it makes me look.” And isn’t that what self care is really all about? Sign up for Reebok UNLOCKED, shop your fave activewear looks, and rack up points to use toward beauty products, fitness classes, supplements, and more—all curated by us!